Since June 2000 we are living in “De Kandelaar”. 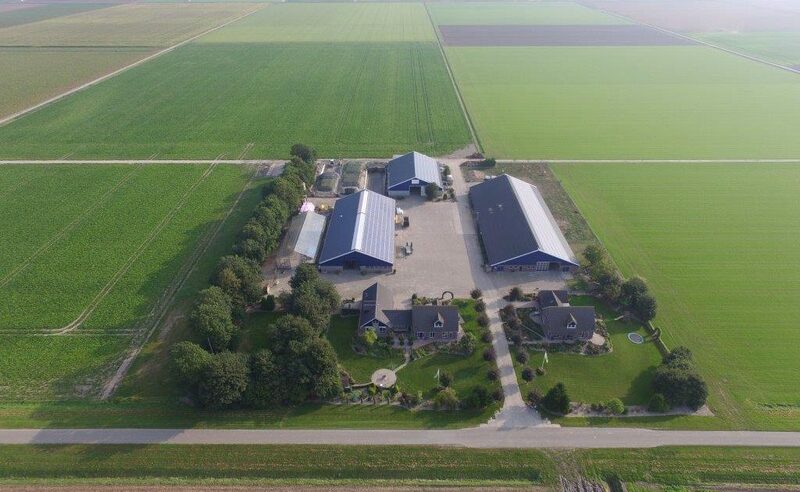 Because De Kandelaar was a former experimental agricultural farm, we built a new cowshed. The houses are newly built in 2000. The space where the bed and breakfast accommodation is, was the former office building for the staff of the experimental farm. To the left of the driveway, you will find the house of Joris & Natasha and on the right is Marc and Mariska’s house. Behind it the barn for dairy cattle. Beyond this you have the barn for dairy cattle. Back of the yard you’ll find the potato / onion repository, showing a wind vane with a picture of ‘De Kandelaar’. Next to this repository you’ll find the three big trench silos. To the left of the yard we have the place with tools and machinery with young cattle in the back and the workshop halfway. And at the far left of the yard there is a large greenhouse, which has been converted to storage of grain and others. The home of Joris & Natasha is directly connected to the former office building, which was renovated in 2008 to Bed & Breakfast accomodation. Since October 2009, the Bed & Breakfast has been officially recognized with four tulips. Besides 110 dairy cows and 90 calves, there are a number of other farm animals. Of course, the dogs Senna, Sahbi and Musta, the cats regularly hunting for mice on the premises, horses Linske and little Brutus, the sheep, pygmy goats and of course our hens.